Best Lane leads down to The Friars. 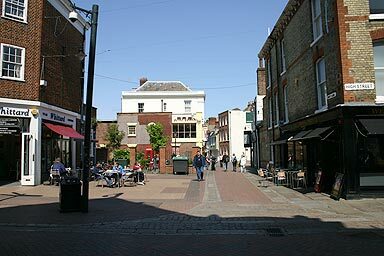 On the left here is Whittards Coffee/Tea shop. In the summer, there's tables here for their clientele. The brick wall at the back of the tables surrounds the churchyard of All Saint's Church. The church itself is long gone and lies under the buildings on the left. You can see the lines of its walls mapped out in the stones in the pavement. Turn left for Eastbridge Hospital and St. Peter's Street, turn right to go up the main street to the centre of the city.